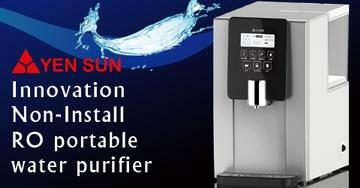 Yen Sun&apos;s "Non-Installation RO filtration Water Dispenser" (model no. YS-8100RWF) is a highly effective water purifying dispenser that requires no complicated setups. Yen Sun&apos;s newest model YS-8100RWF water purifying dispenser can be deployed just about anywhere for immediate use without having to call the plumber. Designed to meet the everyday clean drinking water needs of most users, it comes with a removable transparent water tank with clear water level markings for quick, easy and safe refills. Using the latest reverse osmosis (RO) technology, the YS-8100RWF offers highly effective harmful substance removal capabilities at a higher water recovery rate compared to other traditional products on the market. The YS-8100RWF not only saves more water, it is also energy efficient, featuring multiple power saving modes and meets Taiwan&apos;s highest home appliance energy efficiency ratings. Internally, the hot water storage tank is made of type 304 stainless steel for excellent heat-resistance and hygiene. The entire dispenser is made of fire-proof materials and equipped with multi temperature control protection devices. 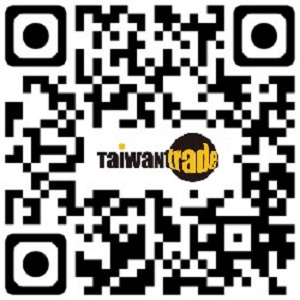 The product is fully designed and manufactured in Taiwan to the highest health and safety standards. With an elegant styling fit for any home and living space, the Yen Sun model YS-8100RWF comes with various great design features, such as a borderless LCD panel for easy touch control, quality metal faucets for extra reliability, and even a guide light so the user can grab a drink when the room is dark. There are also other useful features like the TDS water quality display, a filter replacement indicator, and temperature and function display to help the user ensure the best quality drinking water every day. Yen Sun Technology Corporation is a leading manufacturer of electrical appliances based in Taiwan. Established in 1987, the company specializes in providing OEM/ODM services and supplies home appliances including water dispensers, stand fans, dehumidifiers, and air purifiers to brand customers. Source: YEN SUN TECHNOLOGY CORP.